RESIDENTS living near a site which has been dubbed a ‘cattle market’ after railings were put up to form parking spaces will be consulted over the future of the land. 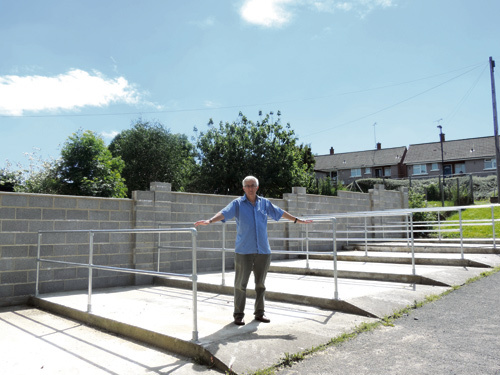 The railings at Albion Close, off Burley Grove, were put in place by Merlin Housing Association following the demolition of crumbling garages on the site. They mark out parking spaces and act as a safety measure for vehicles as the land is tiered. But the move provoked fury from some people living nearby who say the railings make the site look like a cattle market. Residents also argue the spaces the railings mark out aren’t big enough for larger vehicles. Rodway councillor Michael Bell, who lives nearby, is trying to establish what is going on. He said: “Merlin said the reason they put the barriers up is because if someone drove in during the evening with the lights off they would stop them going over the edge so it was done for a safety reason. It may well have been but it’s an eyesore. Councillor Bell said he had met a Merlin representative at the site. “He did say initially he couldn’t pull the barriers down as levelling out the site would be cost prohibitive. “He semi agreed it did look an eyesore and there was talk of agreeing to a use of the space, mentioning a child’s play area. There was nothing in writing - it was just a possibility which was suggested to me. “I think they should either level off the site and take the barriers away so people can use it as garage space or as something for the community. A skateboard park would be an option but you’ve got the problem of whether residents would want children going round on skateboards in the evenings. Hywel Lloyd, spokesman for Merlin Housing Association, said it was too early to say what would happen to the site but it would work with residents to look at possible options. “The garages at Albion Close were not well used – half of them were empty and had been for a long time. They were also expensive to maintain and in need of costly repairs, so we decided to demolish them and turn them into free parking spaces for local residents to use. “The parking spaces provide more room than the garages but we have had to install the railings to prevent cars from driving off the edge of each parking bay. However, this is only a short-term measure until we have decided on the long term future for this site and all our other former garage sites.